Air Compressor Rentals Charlotte, NC | Lewis Systems Inc.
Short term or long term air compressor rentals in Charlotte can make a positive impact on your bottom line if you don’t want to purchase an air compressor for a single project. Whether you need an air compressor for one day or for a few months, Lewis Systems has the air compressor rental you need to quickly and cost-effectively get the job done. We maintain a sizeable inventory of air compressor rentals in Charlotte, from electric to air cooled to oil flooded rotary screw in various horsepower ranging from 25hp to 150hp. If you need oil free or diesel-driven air compressors, just ask. Although we don’t keep these in stock, we will have them available for you upon request. 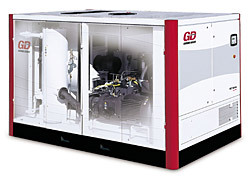 All of our electric air compressors can be delivered to your site. Each have been fully serviced and prepared for long-term use. Hoses and wires, installation and startup, plus overtime and weekend delivery are available at an additional cost. Lewis Systems provides air compressor rentals in Charlotte when you need it for as long as you need it. Contact us for more details and check out our rental list.